If you’ve ever tried to decorate for a child’s birthday party, you are probably aware of the challenges. There are tons of theme birthday parties out there, and each one comes fully equipped with everything you could possibly need. There are theme napkins, theme plates, and matching candles. These items will easily cost you three to four times as much as their non-themed, but equally festive cousins. Worst of all, your child has probably been to twelve birthday parties this year already and they attribute the joy they felt to the perfect theme cake, streamers, and matching balloons. You don’t have to break the bank in order to throw your child the perfect theme party, though. Here are a couple of ideas here that will calm your nerves and your wallet. Decorations at a birthday party are all about the space. The goal as a parent is to tastefully fill the space and provide a festive atmosphere. If you’re buying theme decorations, prepare the second mortgage paperwork. Everything is available from wall decals to table toppers. There is a really simple decoration, though that helps to fill the room, and which children love. This is the inflatable birthday cake. 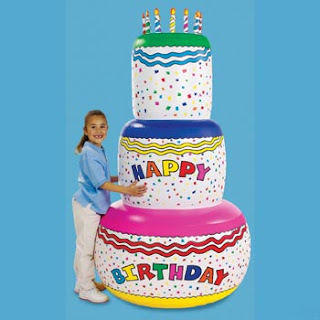 The inflatable birthday cake is a fantastic decoration because it’s new and original. Most kids won’t have seen this at any other party, but it is super exciting. At 6 feet tall, the inflatable birthday cake is bigger than the kids and it really fills up the room. You can cut back on your decorations and best of all a birthday cake will always fit in a birthday theme. It can be used time and again and for multiple children. With a large section of the room complete, it is time to turn to your child’s expected theme. There are several ways to do a theme on a budget and still light up the room. If the theme is character driven, check the local discount store for small plastic figurines that can be used on top of cupcakes. Children get excited about theme birthday cakes, but really they are excited about the toys on the cake. Using these inexpensive figurines on cupcakes gives every child at the party a toy. Your birthday boy or girl will feel like a real hero. Yes, there are streamers and other decorations that are made to go with the selected theme. These things are space filler. If the space in which the party will be thrown is large enough to require these, don’t sweat it. A matching color to the theme will substitute for a fraction of the cost. Children rarely notice these things once they are up. The theme plates are a necessity in most kid’s minds. This is where parents will bite the bullet and spend a little extra. Don’t blow the bank, though. Discretely find some solid color plates that match the theme plates. Little Susie’s mom doesn’t care if her plate has a princess on it. Chances are she will appreciate that it doesn’t.